A curious item, the Monkey Wrench can be used to magically mend an inanimate object through the delicate art of hitting it super hard. Once per day, the Monkey Wrench can whack an object as an action and repair damage up to 1d8 plus your strength modifier. 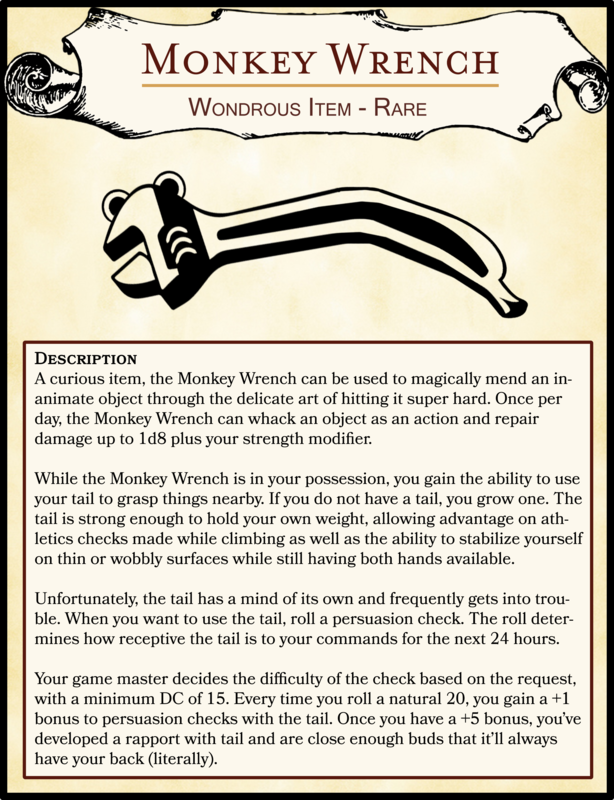 While the Monkey Wrench is in your possession, you gain the ability to use your tail to grasp things nearby. If you do not have a tail, you grow one. The tail is strong enough to hold your own weight, allowing advantage on athletics checks made while climbing as well as the ability to stabilize yourself on thin or wobbly surfaces while still having both hands available. Unfortunately, the tail has a mind of its own and frequently gets into trouble. When you want to use the tail, roll a persuasion check. The roll determines how receptive the tail is to your commands for the next 24 hours. Your game master decides the difficulty of the check based on the request, with a minimum DC of 15. Every time you roll a natural 20, you gain a +1 bonus to persuasion checks with the tail. Once you have a +5 bonus, you’ve developed a rapport with tail and are close enough buds that it’ll always have your back (literally).